My most honest advice that can be given to anyone writing their wedding vows would be this - speak from the heart and stay true to yourself and your relationship. But the main stumbling block for so many couples is - how do you begin? Below I have broken down how to get inspired to write your wedding vows and things to think about to help get those creative juices flowing. Are you poetic or sentimental? Traditional or romantic? Simplistic or formal? Light-hearted or amusing? Choose which tones feel best for you and utilise this to help form your structure. Examples of these could be love, respect, equality, support, unconditional, protection, friendship, honesty, laughter or honour. Think about what makes your bond so special and what it is you will continue to give to the one you love. This could be travel, adventure, health, challenges, bereavement, new beginnings, success, family, culture or achievements. The could be one or two things, or even a handful. It's totally up to you what you'd like to include. Would you like to say them in full? Or answer I do? Will you repeat them line by line after your celebrant? Or read them in full from a script? Will you both repeat the same words? Or say something unique and personal? 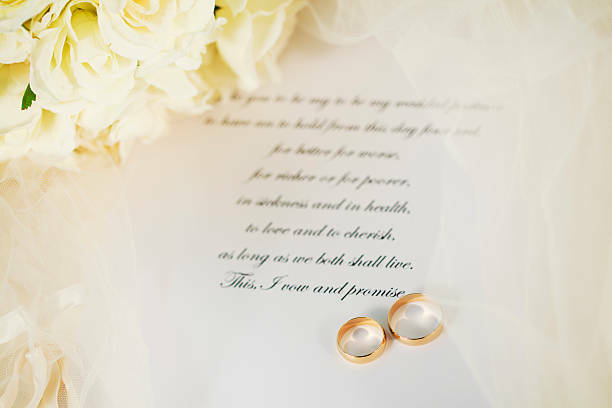 Will you write your wedding vows together? Or surprise each other with your words on the day? Would you like to say them privately? What inspires you about the other person? What promises do you wish to make to them? What hopes do you have for your life together? From this day forward, and every day that we are together. I promise to trust you, be honest with you, and always support you. in bad, and to stay by your side whatever life may throw at us. For whatever comes our way, I am yours and you are mine, together until the end of time. I promise to always be your biggest fan and your partner in crime. I promise to create and support a family with you, in a household filled with laughter, patience, understanding, and love. I vow not just to grow old together, but to grow together. I will love you faithfully through the difficult and the easy. What may come, I will always be there, each one believing that love never dies. As I have given you my hand to hold, so I give you my life to keep. I, ALEX, TAKE YOU SAM TO BE MY HUSBAND/WIFE of my days, the companion of my house, the friend of my life. We shall bear together whatever trouble and sorrow life may lay upon us, and we shall share together whatever good and joyful things life may bring us. With these words, and all the words of my heart, I marry you and bind my life to yours. I PROMISE to choose you every day, to love you in word and deed, to do the hard work of making now into always. To laugh with you, cry with you, grow with you, and create with you. To honor the divinity in you, of you, and around you. To be your kin and your partner in all of life’s adventures. Loving what I know of you and trusting what I don’t yet know, I give you my hand. I give you my love. I give you myself. Will you give me yourself? Will you come travel with me? I, ALEX, DO PLEDGE YOU, SAM TO BE my love, for as long as I live. What I possess in this world, I give to you. I will keep you and hold you, comfort and tend you, protect you and shelter you, for all the days of my life. TODAY surrounded by people who love us, I choose you Alex to be my partner. I am proud to be your wife/husband and to join my life with yours. I vow to support you, respect you, inspire you, and above all love you, for better or worse, in sickness and health, for richer or poorer, as long as we both shall live. I, ALEX, TAKE YOU SAM, TO BE MY WIFE/HUSBAND. And for every day that we are together. Everything that is mine, is yours to share. As your best friend and your husband. I, ALEX, CHOOSE YOU, SAM to be no other than yourself. Loving what I know of you, trusting what things I will discover. I will respect you as a person, a partner, and an equal. There is little to say that you haven’t already heard, and little to give that is not already freely given. Before you asked me, I was yours and I am devoted to you in every way. I marry you with no hesitation or doubt, and my commitment to you is absolute. Do you take me to be your lawfully wedded husband/wife? I CHOOSE YOU! To stand by your side and sleep in your arms. To be joy to your heart and food for your soul. To learn with you and grow with you, even as time and life change us both. I promise to laugh with you in good times and struggle alongside you in bad times. I promise to respect you and cherish you as an individual, a partner, and an equal, knowing that we do not complete, but complement each other. May we have many adventures and grow old together.